As one of the Humble Bundles I picked up the Operation Flashpoint games. 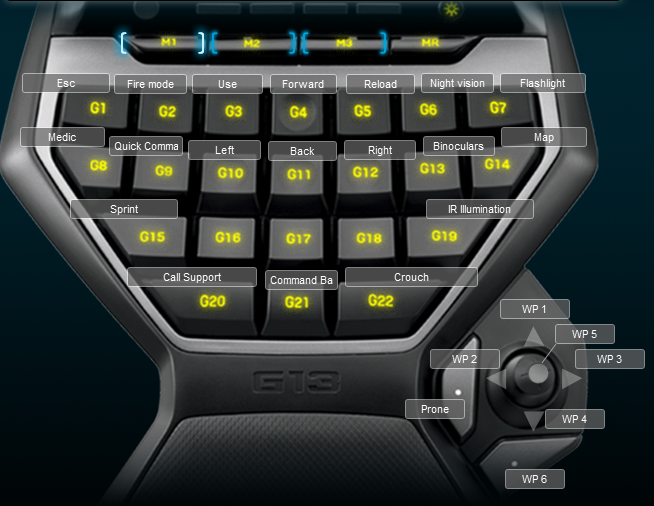 I made up a Logitech G13 profile for Operation Flashpoint Dragon Rising because there wasn’t a default profile. I have only played 30 minutes, but so far I like the profile. It gives quick access to the command menu and lets you select soldiers to give commands to easily using the joystick. I did add the = key because I didn’t’ understand what the ADD key was for zoom. I didn’t actually assign this to a key. I assigned stand and focus to my extra mouse buttons. Below is a screen shot of the keyboard and mouse layouts.